Ireland has no HATE CRIME LEGISLATION to protect people against hate-motivated attacks. Are you with us for LOVE NOT HATE? We hope to see you there! Criminal Law (Hate Crime) Bill was presented to the Government in 2015 by the Hate and Hostility Research Group following a recommendation from the NGO Working Group on Hate Crime. But, this will not become law unless introduced and voted through by the Government. To date, the Government has failed to take the steps it needs to introduce it into law, leaving minorities in Ireland without protection. The YES Equality campaign was an amazing show of public support for equality in Ireland. We want our government to keep going take the next step, and protect those among us who are perceived to be different because of their our skin colour, religion, sexual orientation, gender identity, age, their different physical or mental abilities and so on. We are calling for the government to enact the Criminal Law (Hate Crime) Bill immediately to protect minorities in Ireland. 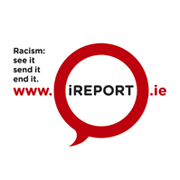 We are Action Against Racism, a group of people from diverse Minority Ethnic backgrounds who are committed to justice, equality and an Ireland where racism and hate have no place. 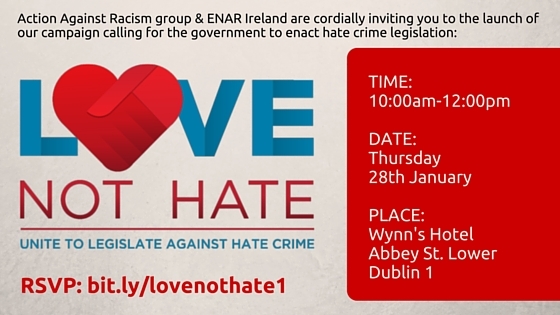 We are working with ENAR Ireland and its allies to fight racism, and to campaign for the introduction of Hate Crime Legislation, within the broader context of a renewed National Action Plan Against Racism. Please RSVP and feel free to circulate this invitation.